The inflation rate is determined by Consumer Price Index released by the U.S. Bureau of Labor Statistics (BLS). The official announcements typically lag behind the calendar by a month or two. The information displayed is raw data, not seasonally adjusted. To convert prices while accounting for inflation, use our inflation calculator. You can also view historical U.S. inflation rates or Consumer Price Index by year. 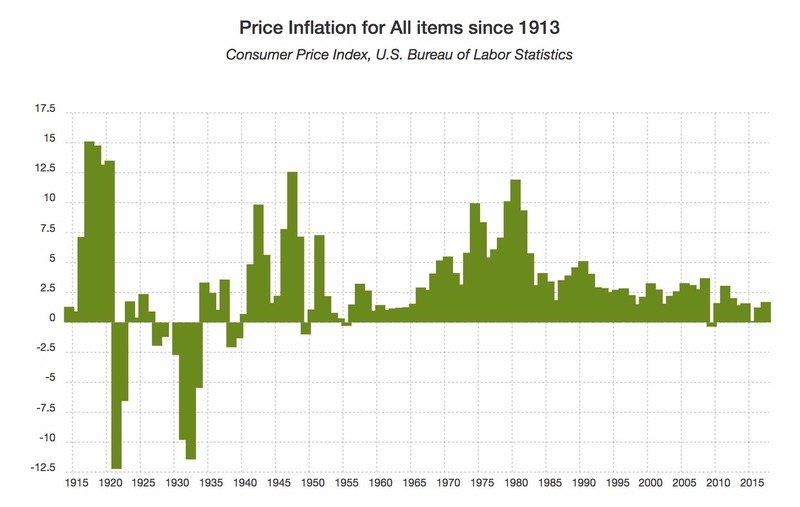 This graph of historical inflation rates is generated using the average yearly value of inflation since 1913, as reported by the U.S. government Bureau of Labor Statistics. Inflation is the rate of change of the Consumer Price Index (CPI). The years with the largest changes in pricing were 1917 (15.12%), 1918 (14.78%), and 1920 (13.51%). This table shows the inflation rate on a monthly basis. The monthly and annual inflation rates are determined by computing the rate of change in Consumer Price Index over a trailing 12-month period. Below are the raw CPI values for each month. Therefore, $100 in 2000 has the same "purchasing power" as $144.59 in 2018.